Directions: From Highway 85 and Highway 90 travel east on 90 to Shoal River,Take the first right after the river bridge. 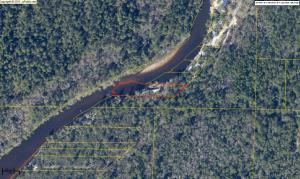 The first of 4 lots is south of the home on pilings contact agent for aerial. Remarks: This white sandy beach on the Shoal river of the Emerald Coast is an awesome place to relax in the sun with peace and quiet but only minutes from town. Exact acreage must be determined by survey. These high bank lots are cleared along the river bank. Bring your RV, fishing pole and cooler stay for the weekend. This entry was posted on April 14, 2017 at 5:14 pm and is filed under Blog, Blogroll, My Blog, OkaloosaFlorida.com blog, TeamSoldTV.com Blog. You can follow any responses to this entry through the RSS 2.0 feed. Responses are currently closed, but you can trackback from your own site.